November 4th, 2006VIDEO – George Bush singing Sunday Bloody Sunday! Hilarious! Insane video of President George W. Bush singing “Sunday Bloody Sunday”! The guy who did this has a LOT of spare time! It is extremely well done! This video has been viewed millions of times all over the internet. It’s a known classic which is why i have to post it on my Xarj blog so all you nice people can enjoy it too! 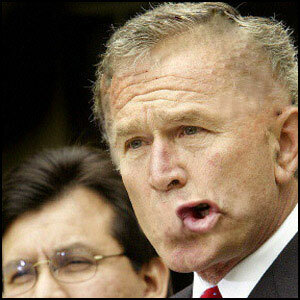 The deformed photo of President Bush was done by XarJ for your entertainment! George Walker Bush (born July 6, 1946) is the 43rd and current President of the United States, inaugurated on January 20, 2001. He was re-elected in the 2004 Presidential election and is currently serving his second term. He formerly served as the 46th Governor of Texas from 1995 to 2000. A Republican, he belongs to one of the most politically influential American families, being a son of former president George Bush and elder brother to Jeb Bush, Governor of Florida. He is often referred to by the nickname Dubya, playing on a stereotyped and generalized Southern pronunciation of the letter W.
A self-described “War President”, Bush won re-election in 2004 after an intense and heated election campaign, becoming the first candidate to win a majority vote in 16 years. Since his re-election, he has received increasingly heated criticism, even from former allies, on the Iraq War, Guantanamo Bay and Abu Ghraib torture and prisoner abuse scandals, as well as domestic issues such as federal funding of stem cell research, Hurricane Katrina, NSA warrantless surveillance controversy, and a number of controversies such as the Plame CIA leak controversy. According to polls of job approval rating during this period, his popularity has strongly declined from its record heights after the September 11, 2001 attacks.